Long-time ATI user. Recently upgraded to Win10 and ATI 2019. I have my workstation connected to my NAS via GigE adapters, GigE switch and Cat6 cabling. My throughput seems fine. I get Gig speeds when copying files from workstation to my NAS. A 1GB video file takes 10 seconds to transfer. Both my workstation and NAS report Gig speeds during the transfer. So this leads me to believe my throughput is fine and that it must be my ATI 2019 that is slow. My 1TB scheduled backup from ATI 2019 takes 24 hours. I am getting only 16MBS backup speeds compared to the 80MBS I get when I copy a file directly. I have compression set to "non" and my CPU does not seem to working very hard. It is a Intel 980 hex core with 24GB of Ram seeing 3% utilization during back up. My 1TB scheduled backup from ATI 2019 takes 24 hours. I am getting only 16MBS backup speeds compared to the 80MBS I get when I copy a file directly. Ralph, welcome to these public User Forums. There are significant differences between copying a file directly to your NAS and using ATI 2019 to make a backup of our 1TB drive and store that backup on the same NAS. ATI uses the Microsoft VSS service to create a snapshot of your source data before then packaging that data into the backup archive file on your NAS. I would recommend downloading the Acronis VSS Doctor tool (link below) and check that there are no VSS issues at work here? Next, check your Performance settings in the Advanced Options page for your backup task as these too can influence how your backup works. Increasing the Operation priority will allow ATI to 'exercise' your CPU and give it a harder workout! Finally, download the MVP Log Viewer tool (link below) and check that there are no error messages being written to the backup log during the extended period it run for. Check the files on your NAS too as any with other than _v1.tib at the end of the file name, i.e. _v1-2 or _v2 etc can indicate that issues have arisen during the process of writing the files. Once my current backup is completed, I will change the operation priority to "high". Also, attached is a copy of my VSS diagnostic report. It doesn't seem like there was any major issues? Ralph, the VSS report looks fine to me. Of suggest setting a tib size on the backup too. A single 1tb .tib may be slowing the NAS down as it searches for a block large enough to accommodate it. How much free space was available when the backup started and how much left when it's done? You might see better performance if you set the .tib size to say 50Gb. Thanks. I am actually backing up 4TB. I created 4 scheduled backups of 1TB to break it up. I do not have any of the scheduled backups set to break up the TIB files, maybe I should try that. The NAS being backed up to has 6 of 16TB free. BTW...I have been able to improve my backups speed from 100mbps average to over 220mbps average. Although, I am still well short of the gig speeds my gig ethernet can handle. - Eliminating bottlenecks on my gig ethernet hardware. Turns out I had some Cat5 cables. I upgraded to Cat6. - Devoted more CPU to the backup process by changing the VSS setting to "high"
- Set compression to "none"
My cpu utilization is still only 4%. I wish I could increase that further as that seemed to have a noticable effect. I do notice at the end of my backups, things get very slow. VSS Doctor is reporting your drive K: is having VSS issues due to insufficient space for shadow copy creation. It is recommended that cleanup of old shadow copies be performed to address the issue. Thanks, that makes sense. I am backing up from K: to my NAS. My backups are now hanging up at the end, not finishing. How best to cleanup old shadow copies? Attached is a copy of the VSS errors I receive. Your logs show that VSS space on drive C: is set to low. It is recommended that 10% minimum be allocated on C: for shadow copies. You will notice that in your screenshot of the VSS Doctor app in the space where C: drive is shown is a box that says Fix Issues. Clicking that box will adjust the space allocation on Drive C: and allocate 15% if memory serves me correctly. For drive K:, your log shows that it has sufficient space allocated for shadow copies but that remaining space is insufficient. In this case the VSS Doctor tool will not fix the issue. Now, looking at the Disk Properties window in your screenshot notice the Disk Cleanup button. Click on that will open a new screen where you will see an area that shows Files to delete which you can do if you like but looking further down you will see a box that says Clean up system files. Click on that box and a new screen will open that will now show another tab entitled More Options. Click on that tab and look for System Restore and Shadow Copies. In that section you will see a button that says Clean up. Click on that button and you will see a confirmation box appear asking if you want to delete all but the most recent restore point. Click on the Delete button to remove all but the most recent shadow copy. The above actions should fix your issue however, you might find that the problem returns before long. If you do then repeat the procedure for drive K: and it should correct it. If this becomes a chronic issue then you will need to remove all shadow copies and restore points on drive K: to overcome this. You can do this from an admin command prompt with the following command vssadmin delete shadows /all. You will be prompted to confirm your selection. You can run the same command from and admin instance of PowerShell if you like. The condition you have is generally caused by one of two problems. An application created a shadow copy but failed to release that copy when finished with it. A shadow copy has become orphaned and so it remains on disk. 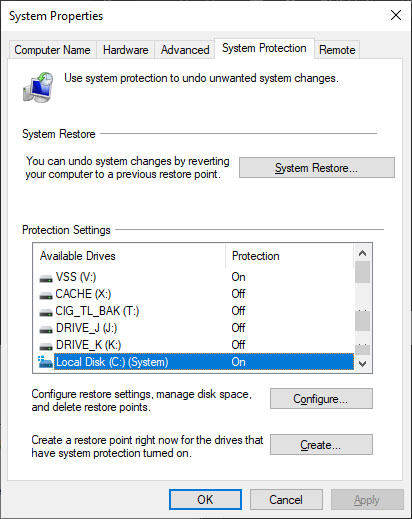 If you have System Restore active on your system and you decide to use the vssadmin delete shadows /all command I recommend that once that command runs that you soon after create a new restore point as all of them will be deleted using that command. I notice that you have multiple drives in your system. I am a like minded user and have used multiple drives for years. Recently I decided that I needed a way to handle large shadow copies so I decided to dedicate an entire disk to VSS only service. I had an old 120GB SSD that I was not using so I installed it in one of my systems. Turned on System Protection on the drive and set the allocation for shadow copies to Unbounded which allows all free drive space to be used for shadows. At the same time I turned off System Protection on all other drives in the system. The result is that shadow copies now created for backups are faster to finish, I only have one drive to maintain and manage shadow copies on, and overall performance of backup creation has improved for me. This is an extreme approach but is effective in cases where large amounts of data need snapshots for shadow creation for backup purposes. That is a VERY good tip. I have plenty of large drives sitting around that I can install and dedicate to VSS. I already have an SSD dedicated to cache for my Adobe software. It's frustrating that I am not even achieving 25% of my network's transfer speed. I was thinking I may have to simply use Sync software instead of the Acronis. If I can get full speed transfers I can be done in hours, even if that means tying my machine up with full CPU utilization. Or should I disable VSS entirely? I do not have System Restore enabled.System Protection is currently disabled for all drives except the C: (system) drive. That said, I might try dedicating a drive like you suggest. I can put in an SD up to 1TB, or a platter drive up to 3TB. I typically create TIB files up to 2TB. Thanks again. I can't tell you how helpful your suggestions are. Periodically you should flush shadows from the dedicated drive. How often depends on usage of VSS. Remember that Windows defaults to between 10% and 15% of free space on a drive. So, 2TB = 2000GB X 15% = 300GB. I find that True Image is very good at releasing VSS shapshots after use because it uses Windows System Writer. Even so you need to keep an eye on it. Use the following command to do so: vssadmin list shadows /for=C: for example to show shadows that exist on drive C: Change the drive letter in the example for each drive as needed. I believe the use of an SSD as a dedicated drive helps in performance of the shadow creation process but just how much I am not sure. I had an HDD setup this way at first, it was a 1TB WD Black drive and it performed almost as good as the SSD I run now. Hope this all helps and gets you on track. It does not seem possible to enable System Protection on the V: drive (VSS Drive) without having it enabled on my C: (system) drive. If I disable C; then all drives disable. When I have C: and V: enabled, True Image still seems really slow, even slower. I also tried disabling VSS and I am still getting 200mbps average...a quarter of my available speed. You must have System Protection enabled on C as well as V drive. I have the same settings with my drive C: set to 15%. I did some testing so that you can have something to compare your backup over network performance to. You have not given any details about your NAS so what I post here may be an apples to oranges comparison then again, it may be something useful for you. Western Digital MyBook 4TB USB drive attached to my network router. A self built FreeNAS server. TerraMaster NAS: 4-bay enclosure using a Linux based OS running a dual core Celeron CPU with 2GB of RAM and a storage array of 4 Seagate Ironwolf 6TB 7200 rpm HDD's for a total capacity of a bit over 21 Terabytes. FreeNAS server: 4-bay ITX chasis using an ASUS H-81 motherboard and an Intel Quad core i5 4570 3.2Ghz CPU with 16GB of RAM and a storage array of 4 Western Digital 3TB 7200 rpm RED HDD's for a total capacity of a bit over 7 terabytes. The FreeNAS server is of course the upper scale device here and the TerraMaster is inline with other multi-drive consumer NAS devices. For NAS devices performance is relative to the hardware used in the NAS device. In general the more RAM and CPU power you have the more performance. Storage drives also play a part as well as how the drives are configured. In my case the TerraMaster uses a JBOD raid array. The FreeNAS uses a ZFS filesystem that supports a ZFS storage pool. Windows OS drive - Samsung 970 PRO 512GB M.2 PCIe Gen 3 x 4. I am posting two screenshots below of the Activity tabs of both tasks and I will notate details below each pic. Above is Activity of backup from the PC to the FreeNAS server Note that compressed backup was 442.2GB. Average network speed was 705Mbps, total time elapsed 1 hour and 20 minutes. I noted a total of between 40 and 45 seconds for the VSS snapshot to complete prior to the backup task beginning to run by timing with a digital stop watch. This illustrates how hardware impacts backup performance. Assuming that you have an NAS device caomparable to one of these here and you cannot achieve this level of performance then there maybe some other cause effecting network performance beyond that of VSS optimization performance. Thanks. It's nice to have something to compare with. I have a QNAP NAS 24TB at 60% capacity. Everything Connected to Gig switch and cables. File transfers are 1GB at 10 seconds, so I know my NAS and Network are getting proper speed. I made all the adjustments we discussed. 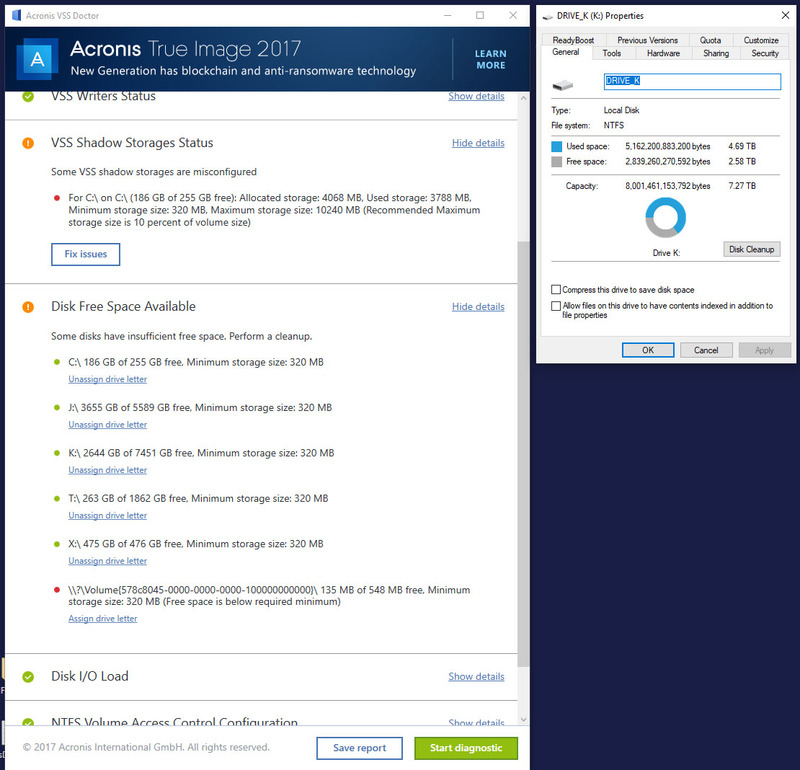 Acronis is not really seeing much speed improvements. My last test backup was 141GB in 2 hours at 308mbps. I did notice that I am not seeing any activity on my V: drive (VSS dedicated) when backing up,. Not sure if I should. I though I would since it is supposed to store my shadow copies. I also did not notice an increase when I disable VSS either. I am testing Macrium Reflect for comparison. I like the data it provides regarding the backups. But so far, even slower than Acronis. I am getting 141GB backup in 3hrs at 103mbps. Based on your report of your 141GB backup at 308Mpbs your data transfer rate is a mere 38.5MBps (megabytes per second). Most modern day hard drives achieve well above that and on a network will transfer about double that amount or between 70MBps to 80MBps. That indicates that you have issue with your network itself. Do you have any devices on your network that may not me operating at gigabit speed such as a printer for example? A single device on a 1Gb network running at 100Mb for example will cause all other connected device to run at the slower speed. Cabling is the next in line for causing a speed issue on a network. I have had cables suddenly drop to lower speeds for seeming no reason. They still work just not at advertised speeds. Hopefully you have a good spare you can check against. I would advise the following to troubleshoot. Disconnect all devices from your network except the NAS. Run a backup and note the performance. Replace the ethernet cable with a spare and retest, compare results. You night narrow down your issue this way fairly quickly. For example by disconnecting all devices except the NAS things improve then, it likely one of the devices you disconnected is not working correctly or, it's cable is faulty. Through Process of elimination you might find your problem. I'm averaging about 565MB on my backups to an old school 4TB WD My Cloud. Any chance your NAS has its own security application that might be scanning data as it's being written? I have a GB network wires through the house and network tests are usually 800MB - 900MB so there is a hit, but since these are spinning drives in the NAS, pretty happy with the writes I'm seeing with Acronis. Macrium has always been a tad slower for me too... Not by much but Acronis beats it in backup and recovery in my environment every time. Is there a health check on the NAS you can perform on the drives too? If it was just Acronis that would be one thing, but seeing it in Macrium also suggests a deeper hardware or network issue. ***edit screenshot added. Also, I had a weird issue the other day where my drive backed up 3 times in a row and filled up my NAS. The more it filled up with data, the slower it started to run. I free'd up the space again, reconfigured the backup (I think it happened after I upgraded drives) and speeds are back to normal again. Another thought, check to see what your network adapter on the PC (and NAS if you have the option) is set. If it is auto-negotiate, try setting it to full 100. Otherwise, if not auto negotiate, try switching to that instead. You may want to grab a copy of the free lan speed test as well and test it with 1GB transfers from machine to machine and then from each machine to the NAS. My assumption is that it is not my network, as I get 1000 mbps when I transfer a file from my K: drive to my NAS. It's only when I run my backup software that my backup speeds are at 300 mbps. My switch, adapters and cabling (cat6, brand new) are all gig ethernet. I also disabled Windows Firewall and Security for testing. I also disconnected all devices but my PC and NAS. Rebooted everything. When I copy files to any of my NAS devices I get the same speeds as I do with True Image backups. Another possibility here may be related to what type of data you are backing up. If the bulk of your backup contains already compressed files that might be the issue. True Image attempts to further compress such data and that does slow things down. I am copying large libraries of photos, Nikon Camera Raw (NEF) files. I break them down into 1.5TB chunks. The only thing so far that improved my speed seems to be when I set the priority level to "High". CPU utilization is now 5%. I wish I could devote more. I have compression set to "none". Have you tried smaller chunks? That might be the issue. 1.5tb as a single file is huge. That will be taxing on the NAS CPU and merry. And, trying to find a block of space for that file will take additional time. I would set Acronis to create the backup in 50GB pieces for the 1.5TB backup... Maybe 100GB so you have less but that's still a big chunk of data to push across the network and process. I imagine you're not copying 1.5tb single files in any of your other tests? Unfortunately, I generate 500GB a year, so that's about the smallest I can get. I should probably clean up some old, non-used backups from my NAS though. That said, when I run a test of 141GB I still only get 300mbps. Because your RAW files are uncompressed and you are not using compression of True Image combined with the fact that you are transferring very large files is possibly over loading your network. If you were to simply select say 500GB of these RAW files using Explorer and copy them to your NAS, what speeds do you get doing that? You can use Windows Task Manager - Performance tab to view Network, Disk, and CPU performance during the copy. Are your numbers there similar to what you get with True Image? You might find that using True Image compression might actually help you. If you try enabling it I would stay with a Normal setting. I will trying limiting my scheduled backup to 500GB (1 year) chunks. I will also try using compression. I thought the compression might have been slowing it. But I am not sure. Let me test. I will also try and clean up my NAS. I ran another set of tests to see how a file and folder backup and a copy of the same data would compare to your results. My previous results were from a Disk and Partitions backup. I selected a data drive in my system, a 2TB Western Digital drive. I selected 15 folders containing various data types and file sizes including a video folder with 47.4GB of files and a picture folder with 41.2GB of compressed JPG and PNG files. All total the amount of data backed up was 727GB. I set compression to Normal, Priority to Normal, and default VSS without writers setting. My results were that the backup completed in 2 hours and 48 minutes. Average transfer speed was 676.8Mbps or 84.6MBps. So overall not much change from my previous results. I think that True Image may use a different method of data handling when a File and Folder backup is selected rather than a Disk and Partition backup. I know that Disk and Partition backups are performed at the Block level, not sure about File and Folder. Next I ran a copy from the same folders and data to the NAS. Time to complete the copy was 2 hours and 50 minutes. My results are consistent between backup with True Image and Windows copy. I cannot explain why yours are not.